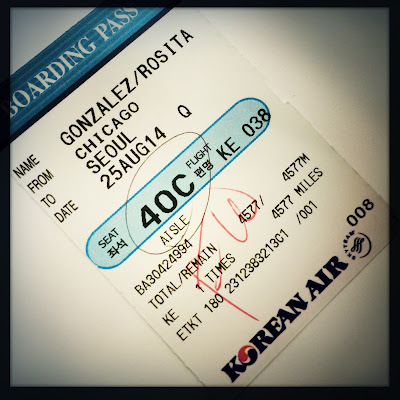 Stepping on the Korean Air plane in O’Hare resembled a purgatory. My experience wasn’t poor, just different. The plane was filled with mostly Koreans and a few Americans (both black and white). As soon as I boarded, all announcements were in Korean first, English second. At first, I enjoyed hearing the novel sounds, but as time progressed, I became slightly irritated. What a great lesson! Here I am viewing life through others’ senses! My privilege was showing. It felt strange to be the “last to know.” This strangeness shouldn’t be new to me. I have traveled to French, German, Polish and Spanish-speaking countries, but it was always evident that I was the foreigner. On this flight, that was not the case. Passengers looked at me and smiled. I wondered what they were thinking. It was obvious to me that I was foreign to them. My dress, my complexion, my gait were all counter to the thin, pale crew. I found it interesting that the members of the crew and passengers would first speak to me in Korean, but when I said, “Sorry … ” the knowing smile and then English. From my economy seat, I didn’t at all feel the classism I have sensed on domestic and European flights. The crewmembers were kind and polite. I often felt I was being a bit too “American,” and was reminded of my Rwandan days when I would defend my country from the insults of a white South African. In those days, when he described the wealthy, American tourists he encountered and how their entitled attitudes sickened him, I broke down in tears, and explained how my family members were not those kind of Americans. America is the only home I have known. I cling to the things that validate my place in my country. But now, I shift to another loyalty, one that has waited far too long.